Artwork for the upcoming game, Star Wars Jedi: Fallen Order has been leaked on Amazon for a T-shirt that is sold by the official Star Wars Amazon store. Alongside the artwork, a small synopsis of what the story will be about was revealed as well. The game will be revealed on April 13 at a panel during Star Wars Celebration. 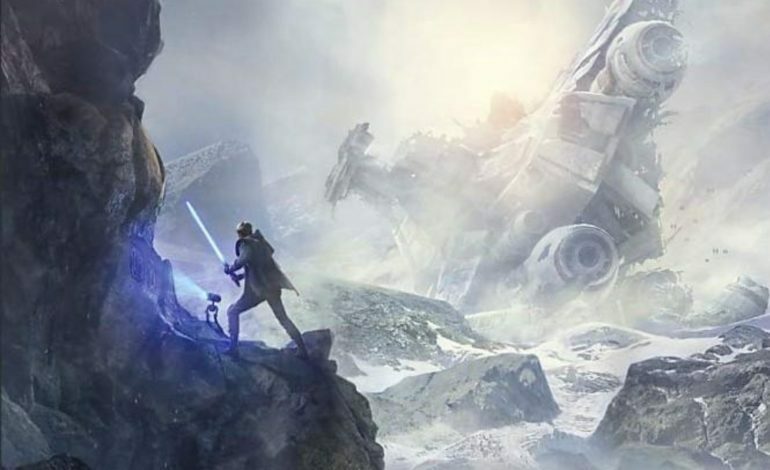 The artwork is comprised of someone with a blue lightsaber on a mountainous planet overlooking a massive, crashed starship. There is also a small bipedal droid illuminating and possibly revealing writings of some sort. Lastly, there is a group of T.I.E. Fighters flying in the sky. As of now, the listing has been taken down, but the description shared some information about the story. Star Wars Jedi: Fallen Order will follow a surviving Padawan after the events of Star Wars: Revenge of the Sith where the Jedi were killed because of Order 66. A developer also supposedly leaked some other details about the game. The story of the game will be cannon. It will resemble Rogue One and Solo and have a bit of the prequels flair. The game will resemble Jedi Knight, Force Unleashed, and a bit of Uncharted. The gameplay is being compared to Dark Souls and being good at parrying will be very beneficial. You will have a backpack companion droid which may be the same droid in the poster. Wallrunning and parkour were also hinted at so you may have some options when it comes to movement in the game. The game will have you going from planet to planet and will be a mix of linear and open world. It may be similar to what the recent Tomb Raider games have been designed in terms of areas you will be able to explore. Two days ago, Star Wars Jedi: Fallen Order was teased with a tweet that says “Don’t stand out”. It was accompanied by what may be the main character’s lightsaber. We’ll have to wait and see what the game actually looks like when it is revealed during Star Wars Celebration this Saturday, April 13. The game will be released during the holidays this year.